Call us now to get in on this exciting revival of the chicken drumstick. Check Out Our Great Chicken Products! All items in our web store come fully cooked and are shipped fully frozen in insulated packaging with dry ice. Due to the perishable nature of the food items, we need your attention to the timely receipt and proper storage of our orders. 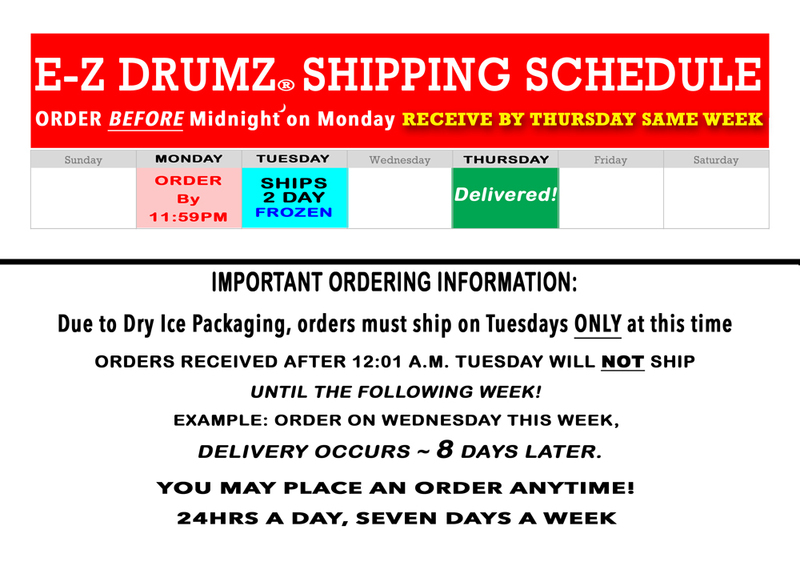 Currently, ALL orders ship ONCE a week with the current shipping day on TUESDAY so your cooler of ChickenStixx products can arrive before the week ends. All orders submitted and confirmed on our web store by 11:59 p.m. Eastern Time Zone on Monday will ship the next day, Tuesday. Any orders submitted after 12:00 a.m. Eastern Time Zone on Tuesday will ship the following Tuesday. We recommend our customers place their orders a few days in advance of the Tuesday cut-off if they want to ensure receipt of their order within a week. All orders ship in a reusable Styrofoam cooler. All orders will ship either 2-Day Ground, 2-Day Air or Next Day for some remote locations. Please note that upon receipt of your order, you must open your cooler immediately and place your ChickenStixx™ in a freezer for later consumption or a refrigerator if you intend to prepare within a few days. For additional questions or concerns with shipping and receiving, please contact our Customer Support team by sending an email. You may also visit our Customer Care Page and see the section “Issues After Delivery” for helpful tips and general information regarding typical shipping and handling topics.